Named after Glileo’s orginal proposed name for Jupiter’s foure Largest moons this spacecraft is an all in one Jool Exploration mission. Driven by the ‘ Medicean Nucelar Stage’ the Space Craft can propell itself into Joolian orbit fom LKO. Once there, the Four Tag-along Satelites: Covalent Sat 1-4, will be deployed into the orbits of Pol, Bop, Tylo, and Val. 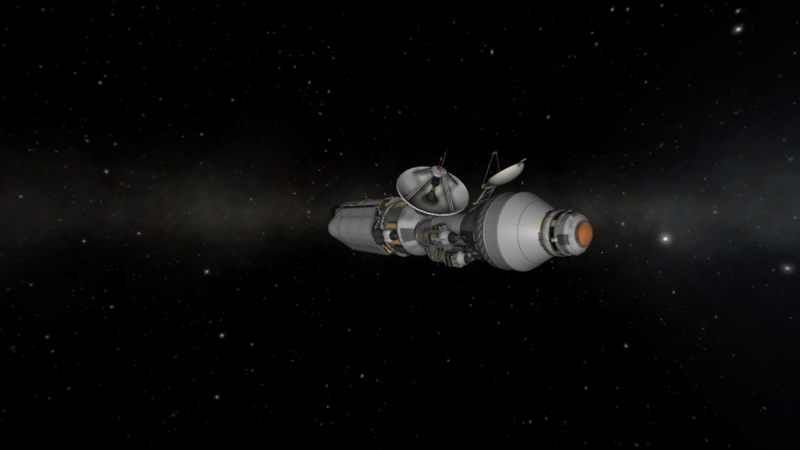 The Cosmica Sidera will then place itself into Laythe Orbit where it will lower its PE into the Laythian Atmo. and release the ‘Shangdu’ Expermental Lander, named after the Landing site of the Huygens Lander from the Cassini mission, This lander after entering the planet’s atmophere, falls to the Oceanic moon’s surface and uses Solid rocket retros seconds before impact to slow impact velocity to survivable speeds. A stock aircraft called Cosmica Sidera. Built with 125 of the finest parts, its root part is dockingPortLarge. Action Groups can be found in the action Group Tab. Actions Group 1 and 2 are shared with main Sat and the Covalent sats do not used unless separated from main craft/ all ride along sats deployed.